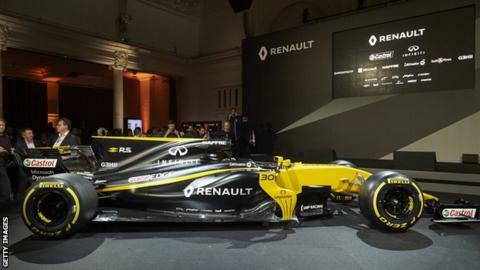 Renault bosses declared themselves "very confident" of a significant step forward in competitiveness this year as they launched their new car. Chief technical officer Bob Bell said he regards the RS17 as "the first real Renault Formula 1 car of the modern era" after finishing ninth in 2016. Renault bought struggling Lotus late in 2015 and inherited a car conceived under major budget restrictions. Renault Sport boss Jerome Stoll says fifth place is the target in 2017. Renault have spent the last year rebuilding the team, adding about 200 employees after the former owners allowed staff numbers to dwindle, and have set themselves the target of battling for the world championship by 2020. The company won back-to-back world titles with Fernando Alonso in 2005-6 the last time they owned the same outfit based in Enstone in Oxfordshire. This year's drivers are new signing Nico Hulkenberg of Germany, who joins from Force India, and Briton Jolyon Palmer, who stays on after his maiden season with Renault in 2016. "What we know about this car so far gives me a lot of optimism," Bell said. "It's a ground-up design as we had the time and the resources to do it, notwithstanding the fact that the change in the regulations demanded it. There is no carry-over of componentry from 2016 to 2017, so it really has been a clean-sheet-of-paper approach. "Our performance metrics show that we've made gains in a strong and consistent manner throughout its development. "If you look at the car itself you will see tremendous attention to detail and sophistication." Pre-season testing starts on Monday at Spain's Circuit de Barcelona-Catalunya. Part of Renault's deficit to pace-setters Mercedes is in their engine, which is also used by front-running team Red Bull. Renault said it had found 0.3secs a lap with its fundamentally redesigned engine and the company hopes to catch Mercedes on engine performance by the end of the season. Renault are optimistic of having made a significant progress on power output and fuel efficiency, which are inextricably linked with this generation of turbo hybrid engines that operate under limits of both total fuel load and maximum fuel flow rate. Red Bull team principal Christian Horner said: "It's a brand new engine for this year, a change of philosophy. They've had a big winter. We're hoping for a step in performance." Ultimately, Renault expect to become title contenders but it's way too early for that this year. The pressure is on, though, for the newly rebuilt team to start showing signs of major progress after last year's poor performance. If that does not happen, uncomfortable questions will be asked at Renault HQ in Paris. Renault also announced that four-time world champion Alain Prost has been appointed a special adviser to the executive committee of Renault Sport F1.